ALAZA unique,customized and personalized design pillow sham. Size: 16″W x 16″L, 18″W x 18″L, 20″W x 20″L, 20″W x 26″L. Material: comfortable cotton velvet fabric pillowcase covers with zipper. Feature: antibacterial and hypoallergenic pillowcase,it can keep dust mites, bed bugs and other skin allergens from ruining your good night’s sleep. It’s good for you and your family’s health. Function: decorate your bedroom, livingroom, kids/girls/boys room, hotel room, lounge and so on. Our pillowcase protector is a perfect holiday/birthday gift for your mom, father, boyfriend and girlfriend, ect. Printing: double sides printing, the front is the same with the back. Note: only the pillow sham, sold without the pillowcase insert. 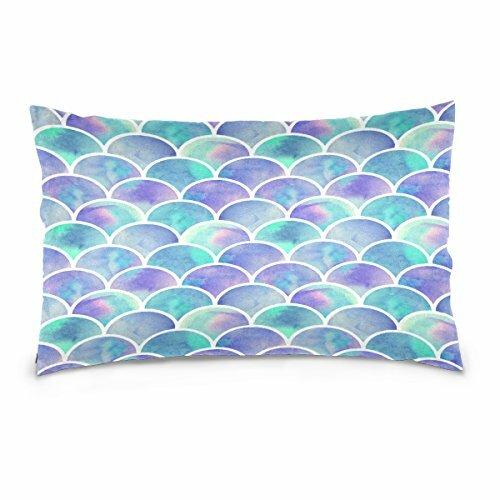 Size: 20″W x 26″L(51cmX66cm)-only pillow sham, insert not included. Material: cotton velvet material with double-sided printing. Feature: super soft, antibacterial, hypoallergenic, eco-friendly and durable. Function: decor your home. A ideal gift for your family member or liver at speical holidays. Easy Care: shrinkproof fabric. It’s best washed under 60 degree water.